Last night was rough...Reagan was waking up at least once an hour and she was wide awake from 4-5:15am! Sometimes she'll actually sleep better in the early morning, but not today, she woke up for good at 7:00am! Thank God tomorrow is Saturday, so Mike can share some of the getting up and I can get a least a little bit of sleep! I feel bad because I know she needs her sleep as well, but I really think these seizures are not only waking her up but also keeping her from falling into a deep sleep! They have definitely increased in intensity, some of them are so powerful that she is almost thrown out of your arms when she has them! Poor baby!! I really hope this medicine starts working soon...it may just need to be increased to work?!?! Luckily, she's been in a much better mood today, a little whiny this afternoon, but still better than yesterday. I am a little concerned because she's been coughing and sneezing here and there and she's beginning to sound congested. I spoke with her pediatrician this afternoon and she's going to get her started on some antibiotics just in case. Please pray that she doesn't get sick because with her immune system as suppressed as it is on this medication, it could really do a number on her! 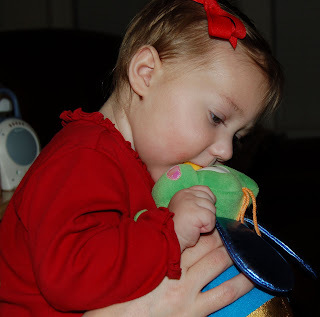 The bug vibrates and plays music...she likes to bite on his nose!! Today has been trying to say the least. Reagan did not sleep well at all last night and she's been extremely irritable all day. Nothing makes her happy, it's just constant fussing and crying! I don't know if it's related to the ACTH or not, but she'll go into these screaming fits like she's having abdominal pain and then she'll pass gas or burp. Unfortunately, it doesn't seem to help and the screaming tends to continue. Her nurse is supposed to talk to the doctor about it today. There's probably not much we can do but grin and bear it. On a good note, Reagan was in a good mood for approximately 45minutes while her vision therapist was here so she actually got some "work" done. Therapy is always a hit or miss with her...she's either in a horrible mood and nothing is accomplished or she's in a good mood. With her behaviour today it was nothing short of a miracle that she was actually good for her therapy session! Her therapist brought a silver pom pom that Reagan was actually tracking back in forth which was great! Aunt Amber watched Reagan so we could go to our first small group bible study. Today has been a better day than yesterday, although it wouldn't have taken much! 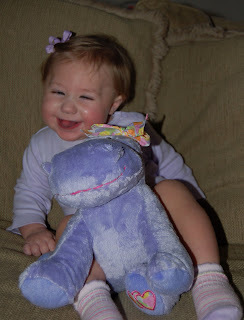 Reagan was a little whiny this morning, but she's been in a great mood this afternoon. She's still not wanting much formula, but she's eating her baby food no problem! I'm still not really noticing a decrease in the seizures, I'll think it's less then she'll have a big cluster of them all at once! She's having anywhere from 11-15 individual jerks an hour and a cluster of 15+ every couple of hours. The nurse said that this low dose may still work in the next few days, so not to give up hope. Keep praying!! 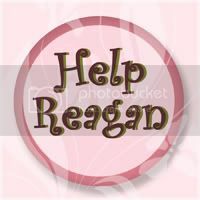 Reagan has been very irritable all day! She woke up fussy and has been fussy ever since! (She didn't sleep much last night, but that's nothing out of the ordinary.) She had to go in today to the hospital to get her blood checked and she cried in the car the whole way there, continued to cry the entire time we were there, and then finally cried herself to sleep on the way home. Poor thing, she must be worn out! Luckily, we have a friend of the family that graciously dedicates her time to help me take Reagan in, otherwise I'd probably go crazy trying to do it myself. Something unusual- this medication is supposed to make her appetite increase, but so far I'm noticing the opposite. I don't know if it's just because she's more fussy, but I'm having a hard time getting her to eat. She doesn't want her formula; she'll drink juice, but she really doesn't want the formula. She's still eating solids OK, but I'm having to force her to drink her bottle. The thing is, compared to other babies Reagan was already low on her intake of formula, but now she's getting dangerously low. I guess I'll just keep an eye on it. So far we're still not seeing any decrease in her seizures. Sometimes it almost seems like she's having more than before. It's frustrating, but I know sometimes it takes a while to work, so I'm going to just try to stay positive. One trend is beginning to emerge though, she seems to be tired after her injections and most nights she's taking a nap after receiving it. At first we thought it was because of all of the crying, but yesterday she hardly cried at all then slept for ~4hrs straight after her injection! I can't remember the last time she slept that long! I know, we should probably take advantage of that, but she usually wakes up after an hour or so. Unfortunately, that did not translate to a good night's sleep, she was awake a lot last night. Today she's been quite fussy again, with periods of hysteria and crying her breath away. I asked her nurse about it and she's going to check with the doctor to make sure that we don't need to increase her dose of Zantac (she has to take a daily antacid because the ACTH can cause intestinal bleeding). Reagan has actually been in a better mood today. Probably because I have help today. I went to a baby shower this morning and Mike watched her. She took a good nap and seems to be in a good mood. She also seems to be eating better today, maybe her appetite is picking up because of the medicine? 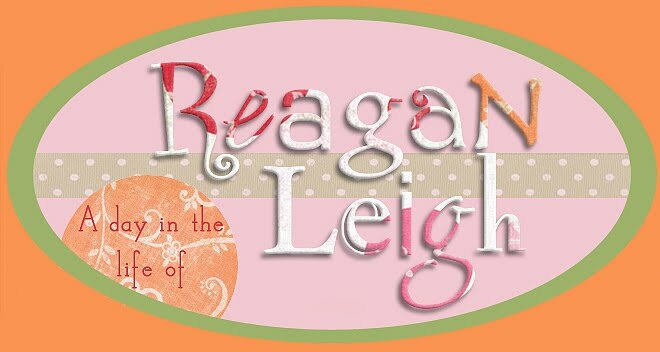 We are going to go to a play tonight with some friends and my mom is going to watch Reagan. She's been out of town for a week and is dying to spend time with her, I just hope Reagan is good especially since she just had her injection! She's getting to be such a pro now, she only cried for 30 seconds or so and then was smiling again! What a sweetie! A nurse from the epilepsy clinic put me in touch with another mom that has just started her baby on ACTH. We spoke yesterday and it was great to talk to someone in the same boat. Her husband is actually giving the injections himself and they had been told to alternate the injections in the thighs and arms. I told her that I hadn't heard of doing it in the arm, so she wanted me to ask our homecare nurse to see what she said about that. Well, our nurse said NO you don't give intramuscular injections in anything but the leg until they are over 2 yrs old, the muscles are just too small. So I spoke with the mom this morning and she contacted the doctor on call. Apparently, they were mislead! They had been told in the hospital to give the ACTH by subcutaneous injection instead of intramuscular!! They've been giving their baby this medication for a week now WRONG!!! And they were about to increase the dosage because they haven't seen a difference in his seizures! What a blessing it is that we were put in touch, otherwise they may not have ever known!! Well, the rice cereal in the bottle didn't work. She couldn't stand the texture of it and kept spitting it out! I did however get her to eat a big bowl of rice cereal with bananas before bed. It didn't really help with her sleep much. She slept for 2 hours to begin with, but then was up again every hour or so after that! As far as the seizures go, I'm not seeing a huge difference just yet, but I still have my hopes up. I spoke with the nurse today and she said at the absolute earliest you might see an improvement after 3 days, but sometimes it takes a week or two or an increase in the medication to see a difference, so we'll see!! Reagan was fussy today, but not hysterical, so it wasn't that bad. She did take a great 2 hr nap this afternoon!! That was nice compared to the 15-30 min naps she's been taking! Last night was another rough night with Reagan waking up every hour! We're going to try giving her rice cereal in her bottle tonight...it worked when we first tried it 6 months ago...maybe it could work again?!?! It's hard to say if there's a decrease in the number of seizures yet, the 2 times that I counted today there seemed to be less, but I don't even know if we would see a difference yet. From what we've read, it usually takes a minimum of 3 days and she didn't get her 3rd shot until 7pm tonight. She was still fussy today but not nearly as bad as yesterday, her nurse was relieved to see that. I think she was a little worried after seeing her so hysterical last night! Today has been quite a challenge. Last night Reagan woke up every hour or so and then was up up from 2-5am! Some day we are going to get some real sleep again! She's been extremely fussy all day today, but I don't think it's because of the medicine because she was already a little fussy yesterday before the shot. Something has to be bothering her, I just don't know if she'd be irritable already from this medication. I'm thinking maybe she's teething, because she has been chewing on her hand a lot and hasn't been eating much the last couple of days. We'll see...we've been thinking she's teething for months now but there's no sign of a tooth! When her nurse came tonight to give her the injection she was crying so much that she didn't even bother trying to check her blood pressure! I'm sure it was sky high! She finally cried herself to sleep afterwards, I hope she wakes up in a better mood! Today was Reagan's first injection of ACTH. She's starting out at a dose of 20 units/day. Her homecare nurse (who seems very nice and has experience giving these injections to little ones) is going to come around 6pm each night to give it to her, but she was a little late tonight so she didn't get the injection until about 7:15. Reagan was pretty tired so she was already fussy, but once we calmed her down after the injection she finally drifted off to sleep (I mean to nap). ACTH is given through daily injections, which a homecare nurse will administer. The nurse will check her vitals daily and we'll take her in once a week to have her blood counts and glucose checked. Reagan will take a low dose (20units/day) for 2 weeks, if her seizures and hypsarrythmia go away then she'll stop, otherwise she'll go for another 4 weeks at double dose (30units/day) and then have 2 weeks tapering off. She can only take it for a maximum of two months. ACTH is a steroid that lowers her immune response, so while she's on it we are keeping her at home and away from all children and sick people! !